Starting today, NFL teams will be able to place franchise and transition tags on potential free agents for the first time. While the window for franchise tags is open, most clubs won’t actually tag any players right away. As our list of important dates for the 2017 offseason shows, the deadline for teams to assign those tags doesn’t come until Wednesday, March 1st. Usually, when it comes to NFL contract discussions, deadlines spur action, so teams will wait until that deadline approaches to officially use franchise tags, once it becomes clear that they won’t be able to strike a longer-term deal yet with their respective free-agents-to-be. 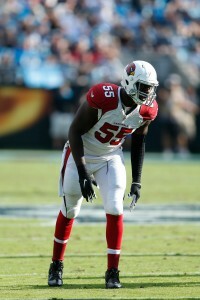 Chandler Jones, DE, Cardinals: Maybe Jones should headline a category titled “Super Duper Virtual Locks.” In January, coach Bruce Arians said that the Cards would apply the franchise tag to Jones if they were unable to immediately lock him up to a long-term deal. Then, just this week, Cardinals president Michael Bidwill offered additional confirmation of that plan. The $16.955MM tag will be applied to Jones in the next couple of weeks and the two sides will then have until the summer to work out a long-term deal. The odds of a longer pact coming together seem pretty good, considering the Cardinals knew what they were getting themselves into when they traded for Jones last year. Kawann Short, DT, Panthers: Panthers head coach Ron Rivera admits that Short will “probably” be tagged and, unlike ex-teammate Josh Norman, Short doesn’t have a problem with it. The 28-year-old was the third-best defensive tackle in the NFL last year, according to Pro Football Focus, and the Panthers will gladly pay him ~$13.5MM on a one-year deal. A multi-year agreement could require an average annual value of $17MM, so our early guess is that Short will wind up actually playing on the tender. 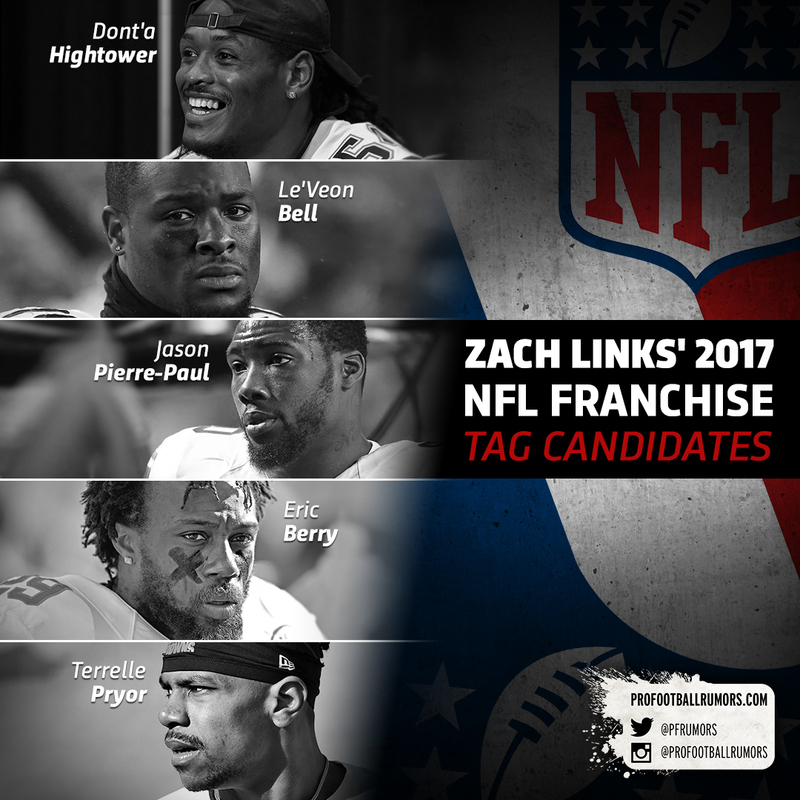 Le’Veon Bell, RB, Steelers: We’ve known for a while now that the Steelers will use the franchise tag on Bell. For all of his off-the-field headaches, Bell still stands as one of the league’s most dynamic running backs and a one-year, $12.3MM deal would suit Pittsburgh just fine. Sometime after the tag is in place, we’re expecting the two sides to agree on a long-term deal. As I wrote in our most recent edition of the Free Agent Power Rankings, Bell will top LeSean McCoy‘s ~$8MM AAV and Doug Martin‘s $15MM in guarantees on a new multiyear pact. Of course, other factors such as cash flow will be pivotal in talks, particularly given the limited shelf life of running backs. 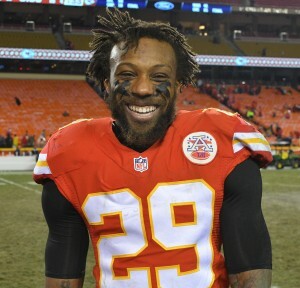 Eric Berry , S, Chiefs: Last offseason, everyone expected the Chiefs and Berry to quickly hammer out a multiyear contract. Ultimately, however, the July deadline came and went and he wound up playing on the franchise tag. This time around, Berry says there’s no way he’ll agree to the tag again. If the Chiefs and their franchise player can’t meet in the middle, things could get ugly this summer. A second tag would cost KC $12.967MM. Dontari Poe, DT, Chiefs: Signing Berry to a long-term deal without tagging him would have the added benefit of allowing the team to use the tag on Poe. Berry doesn’t want the tag, but Poe would probably be open to it since the $13.468MM salary would more than double his 2016 income. Any way you slice it, the Chiefs are going to be tight against the cap, but they can carve out about $17MM by cutting Nick Foles and Jamaal Charles this offseason. Jason Pierre-Paul, DE, Giants: After his fireworks accident two years ago, the Giants re-upped Pierre-Paul using the franchise tag. Despite the many doubters out there, JPP managed to perform in his injury-shortened season. The following year, JPP was handed yet another one-year deal from the Giants and, once again, he came through. He’s down one-and-a-half digits, but he also has one-and-a-half seasons of strong football after his mishap proving that he is an elite edge rusher. Pierre-Paul won’t want another prove-it deal, but the Giants may find that the one-year, ~$17MM tag is the most prudent move. Kirk Cousins, QB, Redskins: The Redskins tagged Cousins at $19.95MM last season, so a repeat tag would cost them $23.94MM. If they go that route, they’re likely to use the non-exclusive tag on the QB, according to one Redskins beat writer. That means that Cousins could be stolen away by another club desperate for quarterback help (like the 49ers or Browns), but it would cost them two first-round picks. There has also been talk of a tag-and-trade scenario, but that sort of thing is more suited for the NBA. A.J. Bouye, CB, Texans: How exactly should the Texans approach negotiations with Bouye? 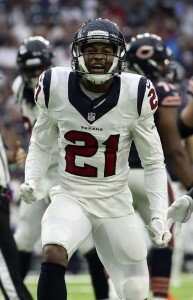 A relative no-name for the first three years of his career, Bouye exploded in 2016 and wound up as a top cornerback in the NFL. A one-year, $14.297MM tag could keep Bouye away from free agency and give the Texans another year to better evaluate the former UDFA. Still, that would tie up a ton of cap room for a team that has multiple areas to address. It’s possible that the Texans could sell Bouye on playing it safe and taking a below-market multiyear deal with healthy guarantees in the first two seasons. Terrelle Pryor, WR, Browns: Last month, one report indicated that the Browns are “very likely” to place the estimated $15.826MM franchise tag on Pryor. With the most cap space in the league, the Browns can easily afford to tag Pryor, but both sides would prefer a long-term deal. Recently, the Browns ramped up their efforts to get something done with the Ohio State product and agent Drew Rosenhaus. The Browns will tag Pryor if necessary, but we’re not sure it’ll get to that point. Trumaine Johnson, CB, Rams: Last summer, the Rams felt they could keep only one of their two standout cornerbacks and they went with Johnson over Janoris Jenkins. Johnson remained with the team under the franchise tag and had a good year, though not a great one like Jenkins had with the Giants. Alden Gonzalez of ESPN.com recently told us that he expects the Rams to do “whatever it takes” to keep Johnson in the fold, and that could include an expensive repeat tag. At the same time, the Rams would greatly prefer to work out a multi-year deal that doesn’t zap their cap in 2017. Melvin Ingram, LB, Chargers: Ingram is No. 4 on our Free Agent Power Rankings, but he might be the best player with a realistic chance of hitting the open market. The Chargers have a lot of holes to fill as they gear up for their first season in L.A. and they might not be able to afford Ingram at a $14.754MM salary. We’re expecting this late bloomer to explore the waters of free agency and potentially swim elsewhere. Dont’a Hightower, LB, Patriots: Hightower is a heck of a player, but a one-year, $14.754MM deal is a whopping price to pay for an inside linebacker. Would the Patriots go that far to keep one of their defensive anchors? It’s possible, but it seems more likely that the two sides will shake hands on a long-term deal before the March 1 deadline. Alshon Jeffery, WR, Bears: When the Bears used the tag on Jeffery last year, the feeling was that he would have to turn in a full, productive season in order to get his big payday. Instead, the Bears saw another so-so season from their star wide receiver that only spanned 12 games thanks to his four-game PED ban. A second tag would cost $17.5MM and we can’t see the Bears going that route, unless they think they can swing a tag-and-trade. Stephon Gilmore, CB, Bills: Gilmore has said that he doesn’t want to be hit with the franchise tag, so his placement in the long shot section should make him pretty happy. Here’s what didn’t make the Bills happy – a mediocre 2016 which made some worry that the former first-round pick has regressed. We’re not expecting the Bills to use the one-year,$14.297MM tender on Gilmore, but nothing can be ruled out since the front office always finds a way to surprise us in Buffalo. Portions of this post have been modified from an earlier post by PFR editor emeritus Luke Adams. Does an editor emeritus get a plaque or anything cool like that? He was given a brand new Jaguar F-TYPE R Coupe. I can’t wait until I’m an editor emeritus someday. I wonder what that customized Dierkes Edition would go for at Barrett-Jackson.